ACC Telecom is an authorized Platinum- level Toshiba Dealer. Toshiba represents quality, reliability, innovation and a secure pathway to the future for our customers. Our Toshiba customers have the ability to easily migrate or upgrade their business phone systems, retaining much of their initial investment. Additionally, Toshiba and ACC Telecom offer the industry’s only seven-year manufacturer’s extended warranty. Together, we are committed to supporting business transition into the IP world with customer driven communication solutions and world-class services. 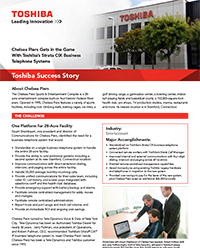 Please view Toshiba success stories and case studies by industry below and feel free to contact us for more information. Toshiba’s IPedge® IP business telephone system helped New Method Wellness, a center for addiction treatment based in San Juan Capistrano, Calif., meet its communication goals. Led by Authorized Toshiba Dealer smplsolutions and New Method Wellness CFO, New Method Wellness now has a Toshiba IPedge EP business telephone system serving a dozen users; Toshiba’s IP4100 wireless DECT telephones; Toshiba’s IP5000 IP series telephones; Unified Messaging; and Enterprise Manager for remote system administration. With Toshiba’s IPedge, New Method Wellness reached its goal of empowering its employees to communicate more effectively with their clients, their clients’ families, and each other. Brookhaven Memorial Hospital Medical Center is a 321-bed acute-care, voluntary not-for-profit community hospital. It is comprised of the main campus, two community multi-disciplinary health centers, and its expanded Hemodialysis Program, Home Health and Hospice/Bereavement Services, as well as an off-site ambulatory Women’s Imaging Center. Brookhaven Memorial is located in East Patchogue, New York. 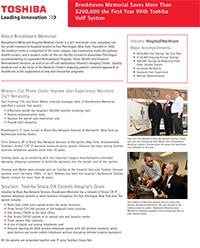 With Toshiba’s Strata CIX VoIP system, Brookhaven Memorial saved $224,000 in the first year by cutting monthly phone costs by $12,000 and retaining the investment of its older Toshiba system by re-using existing equipment, which saved an additional $80,000. The hospital expects an ongoing annual savings of $144,000. Toshiba’s IPedge® EP IP business telephone system helped EYEMAGINE, an Irvine, Calif.-based eCommerce innovator, meet its communications goals, including empowering the company with the latest VoIP technology. EYEMAGINE has one IPedge EP pure-IP business telephone system, which gives the company a single-server solution and a big-business communications presence while servicing less than 40 users. The company also has Toshiba IP 5000-series desk telephones and Unified Messaging, which allows users to receive email, faxes, and voice messages all in their email inboxes. The new system also provides an Auto Attendant with time-of-day greetings, direct-dial extensions for all users, individual voice mailboxes, and Toshiba’s Enterprise Manager for simple and localized on-site management. IPedge also gives EYEMAGINE the ability to scale the telephone system as the company grows. Toshiba’s VIPedge™ cloud-based business telephone solution has helped Rickmar Properties (www.RickmarProp.com) exceed its communications goals. A family business, Rickmar Properties is responsible for the development and construction of more than 4 million square feet of retail, office and industrial space in 15 states. Toshiba’s VIPedge solution met Rickmar Properties’ communications objectives with Toshiba IP 5000-series large-display desk telephones; Toshiba’s “Find-me Follow-me” application to route office calls to users’ mobile phones; and Toshiba’s Enterprise Manager, which allows simple, browser-based administration and management. Rickmar is now enjoying an affordable, richly featured and dependable cloud-based communications solution that also delivers an annual cost savings of more than $6,000 over its previous telecom service costs, all without the need to maintain an on-premises telephone system. Toshiba’s IPedge® IP business telephone system has helped Paddock Chevrolet (www.PaddockChevrolet.com), the largest passenger sales volume Chevy dealer in the nation for nine of the last 10 years, exceed its communications goals. Paddock Chevrolet’s new Toshiba system includes one IPedge EC system, which covers four buildings across several city blocks, and 100 Toshiba IP5000 series IP telephones. Paddock Chevrolet now has Unified Messaging, which delivers all email, voice and fax messages to a single inbox; Toshiba Automatic Call Distribution (ACD) applications, which include TASKE reporting and OAISYS Tracer call recording; and Toshiba’s Call Manager™ unified communications solution. In addition, Toshiba’s Enterprise Manager also provides browser-based administration and remote management. The new system saves Paddock Chevrolet more than $20,000 per year. 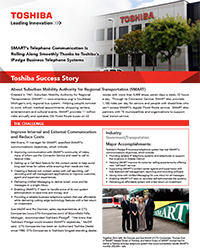 Toshiba’s IPedge® IP business telephone system has helped Suburban Mobility Authority for Regional Transportation (SMART) exceed its communications goals of processing more than 250,000 incoming calls each month and will save more than $400,000 in the first five years of use. Serving the Greater Detroit area, SMART (www.smartbus.org) is Southeast Michigan’s only regional bus system and provides 11 million rides annually, operating more than 5,000 stops, seven days per week, 22 hours per day. SMART’s new Toshiba system includes four IPedge systems and more than 350 Toshiba 5000 series IP telephones and 13 IP4100 wireless telephones. Toshiba’s IPMobility application connects users’ smartphones as extensions on the new systems. SMART also has Toshiba’s Call Manager™ unified communications client; Unified Messaging, enabling users to receive voice messages and faxes in their email inboxes; and Enterprise Manager for remote system administration of all locations. 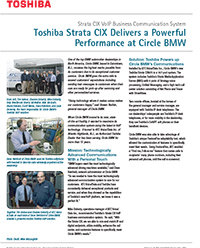 Moving to the Toshiba Strata® CIX™ IP business communication system gave Circle BMW a cost savings of $1,800 per month by going with a single platform for all its voice communications, plus another $700 per month savings by using the Toshiba call center solution. The biggest benefit for Circle BMW was the ability to integrate its voice communications with its customer database, allowing it to deliver exceptionally personalized service. One of the nation’s first completely online universities, Columbia Southern University (CSU) was developed to meet the demand for alternatives to the traditional university experience. Its degree programs are offered completely online, giving students the flexibility to fit their educational pursuits around career and family commitments. At CSU, associate, bachelor, master, doctoral and certificate programs are available in a variety of fields including fire science, criminal justice, business management and administration, information technology, human resource management and occupational safety and health. CSU is headquartered in Orange Beach, Alabama. For the 160-year-old Westminster College in Missouri, Toshiba’s Strata CIX VoIP business telephone system provides unparalleled reliability, functionally and features for its 1000+ users. Handling more than 20,000 incoming calls every month, the Toshiba Strata CIX helps the college’s workers stay connected across 28 on-campus buildings and 10 remote locations. Remote management helps the system administrator ensure that all changes and issues are handled quickly and easily from his desk. Toshiba’s Strata CIX has helped the college save $170,000 in savings over seven years and has delivered dramatic improvements in efficiency. Toshiba’s Strata® CIX™ IP business telephone system helped Chelsea Piers Sports & Entertainment Complex, a 28-acre sports village built on four historic Hudson River piers, with its communications needs. Chelsea Piers’ new telephone system includes a Strata CIX1200 business telephone system, more than 350 Toshiba telephones on site, Toshiba’s Strata Media Application Server (MAS), and Toshiba’s Call Manager for unified communications. Toshiba telephone systems provided Chelsea Piers with an immediate return of investment; they saw $26,000 in yearly savings. A film technology pioneer, IMAX Corporation utilizes Toshiba Strata CIX VoIP systems to unify its corporate communications, reduce long distance charges, and improve telephone reliability by eliminating system downtime. Having remote administration capabilities improves productivity and reduces travel costs for IT management. Using Toshiba’s National Accounts Program, IMAX Corporation has consistent billing, installation and support of its Toshiba systems in the United States and Canada, with the advantage of having a single Authorized Toshiba Dealer contact point. The Toshiba Strata CIX systems have helped IMAX Corporate generate a significant savings on their monthly recurring business communication costs. 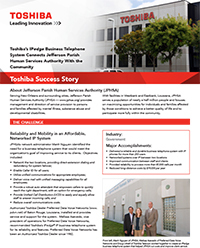 Toshiba’s IPedge® IP business telephone system helped Jefferson Parish Human Services Authority (JPHSA) with its communications goals. JPHSA was in need of an updated telephone system to network its two locations, JPHSA’s new solution includes award-winning Toshiba IP telephone systems and applications: IPedge EC IP business telephone systems; IPedge Net to network the locations together; and IP telephones for more than 200 users; Call Manager™ unified communications client; Unified Messaging; and Enterprise Manager for remote system administration of both locations. In addition, moving to the new Toshiba systems saves JPHSA more than $19,000 annually. 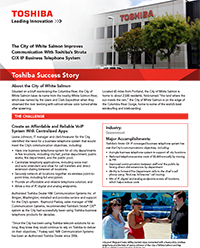 Toshiba’s Strata® CIX™ IP business telephone system has helped the City of White Salmon, Oregon, connect its community, employees and five-site network, unifying communications and providing cost savings for the city. The City of White Salmon is on the edge of the Columbia River Gorge and is home to some of the world’s best windsurfing and kiteboarding. Its new Toshiba telephone system includes a Strata CIX100 business telephone system at City Hall and endpoints at four other locations. The system also includes centralized voice mail and auto attendant as well as unified messaging for select users, which allows them to receive their voice mail via email, increasing privacy and confidentiality. The City also now has the ability to grow and migrate to new communication technologies in the future. Toshiba’s Strata® CIX™ IP business telephone system has helped Titan Machinery, an agricultural, construction and consumer products dealership based in Fargo, North Dakota, with its communications needs. 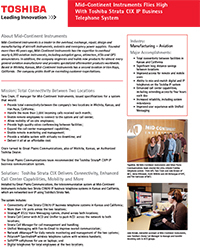 Titan Machinery’s new telephone system includes a Strata CIX670 business telephone system at its headquarters as well as Strata CIX100 and CIX40 systems at its store locations across the Northern Midwest while Toshiba’s Strata Net networking connects all the store locations to each other and to corporate headquarters via IP. 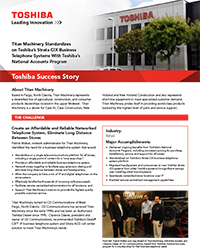 Titan Machinery also is able to centrally manage all systems remotely with Toshiba’s Network eManager®. 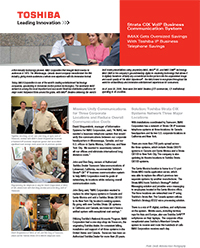 In addition, Toshiba’s National Accounts Program provided consistent pricing for purchase, installations, service and support for all locations. 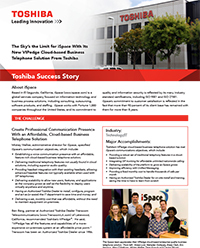 Toshiba’s VIPedge™ cloud-based business telephone solution has helped iSpace, a global services company focused on information technology and business process solutions, with its communications goals. iSpace’s communications objectives were met with the VIPedge solution, which serves more than 30 users in two California locations plus remote users in Boston and Tampa. iSpace now has Toshiba IP 5000-series desk telephones as well as Unified Messaging, which enables users to receive both voice and email messages in their email inboxes. iSpace administrators also use Toshiba’s Enterprise Manager, which allows simple, browser-based administration and management. Most importantly, iSpace now has a dependable, cloud-based communications solution for an affordable, flat, monthly cost as well as scalability to grow with the company, all without the need to maintain on-premises equipment. Mid-Continent Instruments is a leader in the overhaul, exchange, repair, design and manufacturing of aircraft instruments, avionics and emergency power supplies. Founded more than 45 years ago, Mid-Continent Instruments has the expertise to overhaul nearly 6,000 aviation instruments, including autopilot gyros, altimeters, HSIs and GPS annunciators. In addition, the company engineers and builds new products for almost every general aviation manufacturer and provides specialized aftermarket products worldwide. Based in Wichita, Kansas, Mid-Continent Instruments has a second location in Van Nuys, California. The company prides itself on exceeding customer expectations. By eliminating long distance charges between offices in the United States and its sister company in Thailand, Omega Castings saves about $2,000 per month, allowing the system to pay for itself in less than four months. 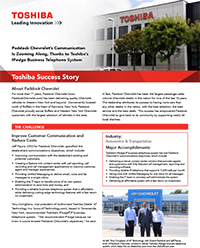 Toshiba delivered a converged IP and TDM-enabled system that helped the company save $14,000 the first year, and $20,000 annually thereafter, in eliminated telephone lines and costs between its United States offices. In addition, the Toshiba telephones used by the owner have special amplified handsets that work with his cochlear implants and allow for clarity, even in the foundry’s manufacturing environment. Contact us to learn more about our Toshiba business phone system solutions.